One of the great things about Firefox is Mozilla’s willingness to experiment. That’s especially true of Test Pilot, Mozilla’s opt-in platform for trying out new browser features. Color is one of two new extensions that just launched. 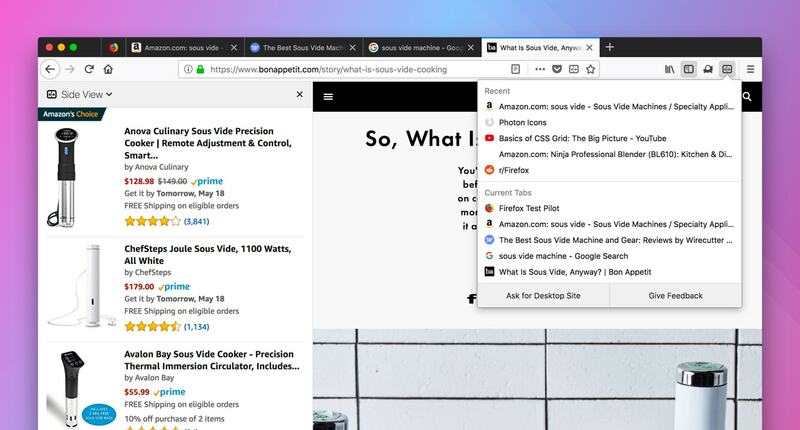 As the name suggests, Firefox Color allows you to change the color of nearly every element in your browser including the background, tabs, toolbar icons and text, the search bar and more. Mozilla offers a number of preset themes and you can even save and share your own creations with others. Side View, meanwhile, is essentially a multitask-enabling extension. It allows you to have two tabs open at once by showing sites in a mobile view so they fit into a smaller space. This can be done on your own by simply arranging two windows side-by-side or adding a second monitor to the mix but in a pinch, Side View can be a convenient workaround that saves a lot of time. With the extension installed, simply clicking the associated toolbar button will send any tab to Side View. If you do a lot of comparison shopping, want to keep close tabs on social media or are working on a report, Side View could be incredibly handy. I’m personally not quite as stoked about Color, only because I’ve lived through the GeoCities / Myspace era and remember how poorly “custom” web design can turn out. This SideView looks and sounds like a limited IFRAME supported by the browser instead of HTML. So... We're getting Themes back? Interestingly, multi-tab thing has been around since... well, as long as tabs have been a thing themselves, but somehow it's a feature that gets overlooked by many browser developers. I need help with Sims2! Can you install two expansion packs at once? Audio out of two soundcards at once? Two Full Screen Games at Once?